I usually find Ramadan to be a productive time because of all the time that is freed up from not thinking about food, preparing it or eating it during the day. I have been trying to use some of my time to catch up on sleep, but that has still left with me with time to slowly work my way through my evolving to-do list. I have a bit of a thing about to do lists and have used lots of different tools to manage my to-do list including my Filofax, paper lists and lists on my computer, half a dozen templates that I have designed for work to track my tasks.. 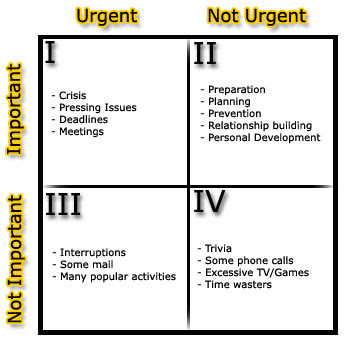 The one that I have found the most helpful has been the to-do quadrant. I first came across this a few years ago in one of Stephen Coveys books (called The Covey time management matrix from his book First Things First). I usually do this onto a sheet of paper that I can update or cross off as I go. The paper list means that it can go into my handbag when I go out, as a reminder of things I need to do when I am out. I usually leave a blank space at the bottom for shopping lists or things that don’t fit into any of the quadrants. Most of my blogging ideas go into the “would like to do” list, but some make it into the important list if I have a commitment to review/blog about something or it is a long-term project that I really want to do and would just sit on the back-burner otherwise. Umm Salihah's Eid Gift Guide - Updated!